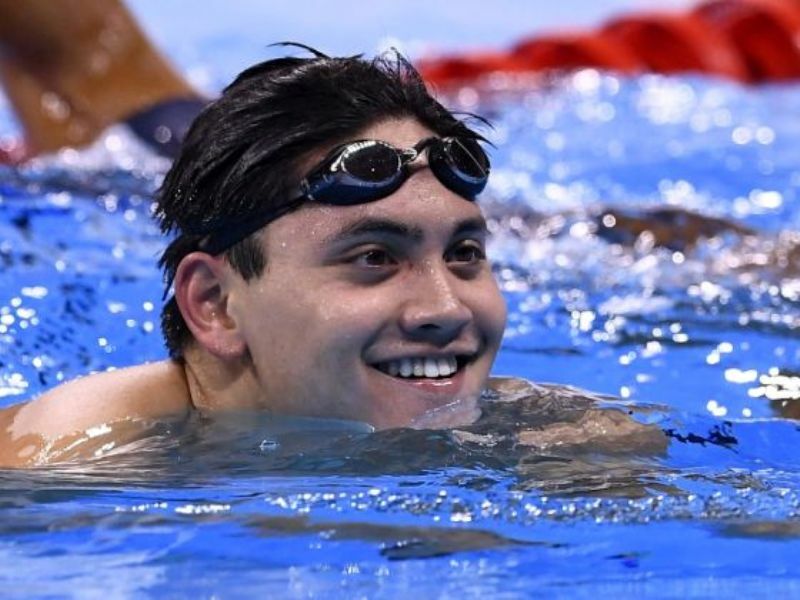 You are here:Home » Other Reads » Joseph Schooling, Singapore's First Olympic Gold Champion! We may be just a little red dot in the world map, but we did it! Yes, it's a GOLD! For the international readers, in case you haven't heard, Singapore won her first ever Olympic gold medal on Saturday! Congratulations Joseph Schooling, you have done us all proud by winning the 100m butterfly event at Rio 2016, beating American great Michael Phelps! I guess this makes a great gift as the nation celebrates her 51st Birthday! Happy Birthday, Singapore! I am usually not into sports, but this is a historical event that's too good not to share as the nation rejoices! Butterfly specialist Joseph Schooling, clinched his first Olympic Gold medal at the 100m butterfly event on Aug 13 by setting a new Olympic record of 50.39 seconds! It is also the first ever gold medal by a Southeast Asian male swimmer! 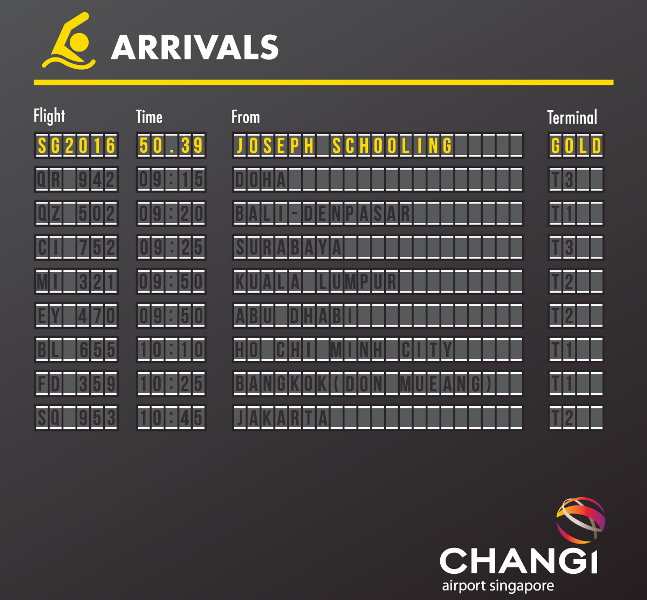 Changi Airport Announcing the Arrival of Singapore's First Olympic Gold Medal. Sorry folks, there will be no public holiday on Monday; school as usual! Of course being Singaporeans, people are fast to jump into lottery too. 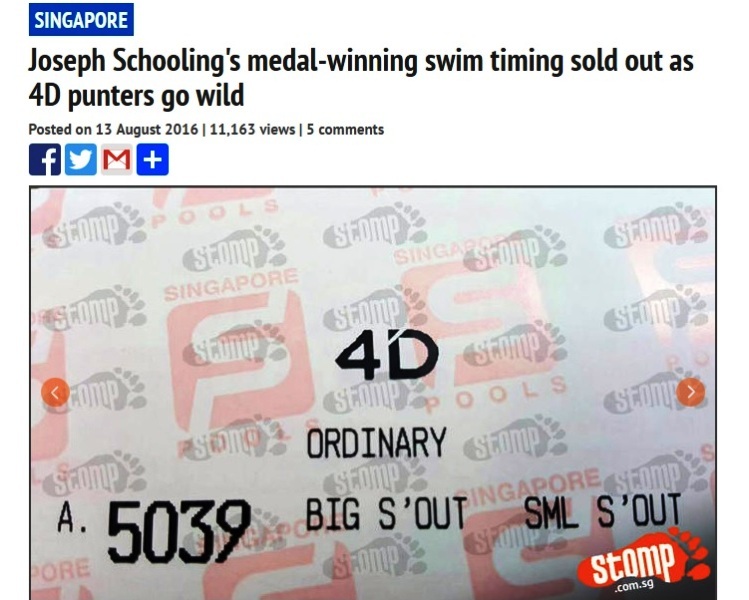 Joseph Schooling's Olympic swimming timing 50.39 secs, which translates into 5039 4D numbers were sold out in no time! LOL! If you have missed the exciting moment, here's the video from The Star Online. Be sure to turn on the volume button on the video! As for the prize money, the 21-year-old Singaporean can look forward to prize money of SGD 1 million, an incentive scheme devised by the Singapore National Olympic Council ( SNOC )! 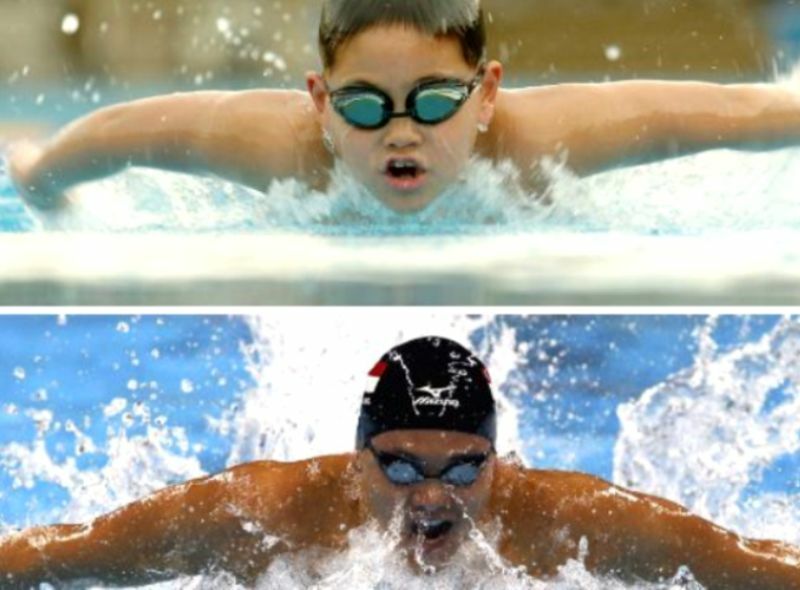 If you are wondering if Joseph Schooling is a foreign talent, not at all; he is a true blue Singaporean! For the international followers here, if you are still confused with the term Singaporean................ Singapore is a multi-racial society and made up of Chinese, Malays, Indians and others such as Eurasions like our national hero, Joseph Schooling! Singapore has four official languages - English, Malay, Mandarin and Tamil, and Malay is the ceremonial national language of the country. 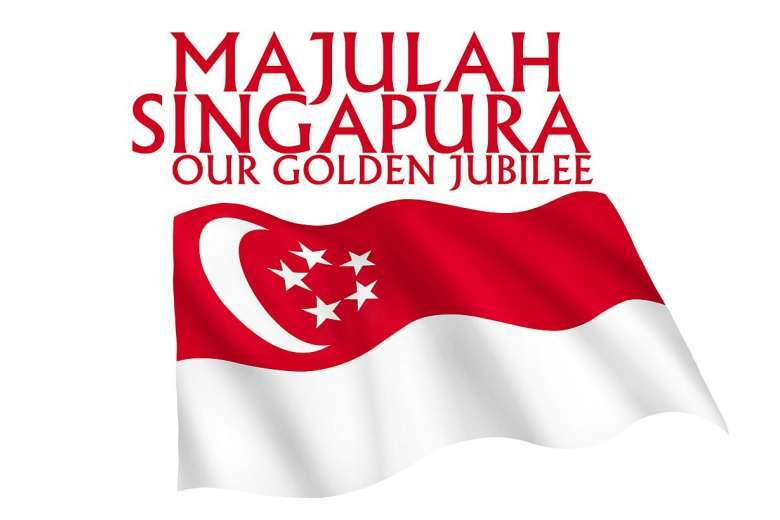 Majulah Singapura! English is our first language, which is the language of instruction in all public schools. Singaporeans speak English from young, so there is no language barrier among the different races. The word " Foreign Talent " is a sensitive issue due to the large import of foreigners mainly from China, and because of the cultural differences between the two countries and also their lack of ability to communicate in English. For the past decade, Singapore has been the only Asian country with the top AAA sovereign rating from all major credit rating agencies, including S&P, Moody's and Fitch. According to the Corruption Perceptions Index, Singapore is consistently ranked as one of the least corrupt countries in the world, along with New Zealand and the Scandinavian countries. Singapore also has one of the lowest rates of drug use in the world. Have you been to Singapore? What was your experience like? Congrats to Joseph and Singapore on your 1st Olympic gold medal. I have never been to Singapore but I would love to visit it some today. Congrats to Singapore for your first gold medal:)! Joseph is really cute!!!! Go Singapore go. Such a proud moment. If at all I am in Singapore, I will make an attempt to meet you Shirley. 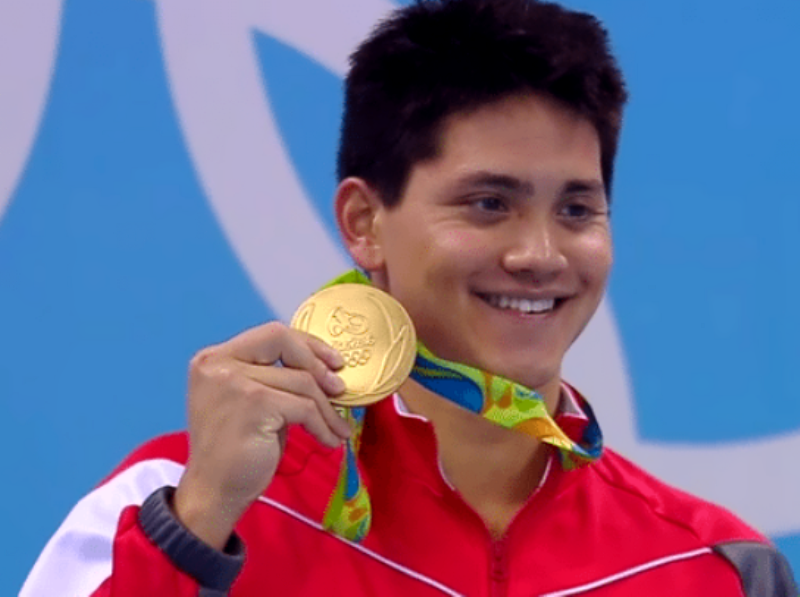 Congratulations to Joseph Schooling,and to Singapore! How wonderful, Shirley! I love all the action photos! I read about it. The amazing story. Congratulations! What an amazing achievement! Congratulations to Joseph Schooling and Singapore! Congratulations to Joseph and your whole country! So exciting! I hope this gets to be the first of many medals! How cool to meet your idol and compete with him congrats Singapore for you swimming olympic win. I heard about this and instantly got goosebumps! How exciting for him to be Singapore's first Olympic gold medalist!! Lots of congrats to him! I'm really overjoyed with this piece of news, finally I can say "Singapore have talents!" - thanks to Joseph Isaac Schooling for bringing glory to our country. Nice post you have written Shirley! Nice post Shirley, we have been following the games and the gold was well deserved. Awesome, Singapore is a wonder place to live.